Since I have moved back closer to home, I have had the fortunate opportunity to fish every day during my lunch break. Not only do I get to relax for roughly thirty minutes throughout the week, I’ve had success while fishing the Atascosa River at River Park in Pleasanton. Granted, it took me nearly a month before my first nibble, but the action has taken off since. And regardless of the size of fish reeled in I have enjoyed every moment. Whether it’s a small crappie, or a decent sized largemouth black bass the encounters never grow old. Some people giggle when I tell them where I fish during my breaks, but laughter transforms into cheers when I show them pictures of my catches. Nonetheless, the method of fishing I use is simple. And anyone with a pole, lure and patience can have the same achievement. 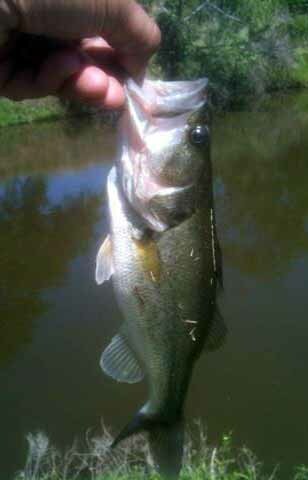 I always use a lightweight rod (5’6”-6’), 6-pound test line and a small spinnerbait. As a matter of fact, you can purchase the same lures at any department store with a sporting goods section. The blade spinner part of the lure can be found separately, along with a vast selection of one-inch swimbaits. Now I’m not telling you this is the only lure that works, although it’s generally the one that gets the most bites. Small topwater lures have been known to work around the river and of course if you can catch shiner in a cast net that would work as well. And with warmer weather around the corner that only means one thing. The fishing should heat up also. I strongly suggest you grab your equipment and head out to the Atascosa River in search of fish. Remember, you can’t catch fish from the couch. And there is nothing better than spending a few hours while searching for any fish possible. Another idea is to take a child, friend, and/or family along because just like anything else. Fishing is better with company. Plus, a bad day of fishing always beats a good day at work.